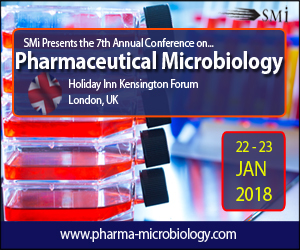 SMi’s 7th annual Pharmaceutical Microbiology UK conference will provide attendees essential indicators for Quality Assurance and Quality Control whilst presenting that latest information on protecting pharmaceutical and healthcare products from spoilage by microorganisms, and protecting patients and consumers. This year’s event will provide an in-depth overview of the function of the pharmaceutical microbiologist and what they need to know, from regulatory filing and GMP, to laboratory design and management, and risk assessment tools and techniques. These key aspects are discussed through a series of dedicated presentations, keynote sessions and workshops, with topics covering biofilms, validation, data analysis, bioburden, toxins, microbial identification, mycoplasma testing, and contamination control. Other event highlights include TWO exclusive post-conference interactive workshops carefully selected to enhance your conference experience and encourage personal and professional development. Places are strictly limited to ensure optimal learning for attendees. Workshop A – Objectionable Organisms – What, Why, Who, How?